Harry Redknapp : I Tried My Best! 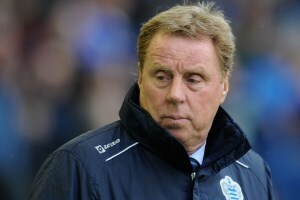 Harry Redknapp insists that he wants to stay with QPR, despite imminent relegation. The 66 year old played down suggestions he was uncertain about staying with the west Londoners, reiterating that any decision on his future lied with QPR’s owners. “I’d rather us have the challenge of building another Premier League team here which I would have done and we wouldn’t be in trouble,” Redknapp said. “If I had started at the start of the year and we’d have been where we are I’d have gone ‘Yeah, I put the team together lads and I’m sorry I’ve put a bad team together and that’s where we are’.